This year we shortlisted six local charities nominated by you before opening a vote to decide which will be the charity that we support in the upcoming year. 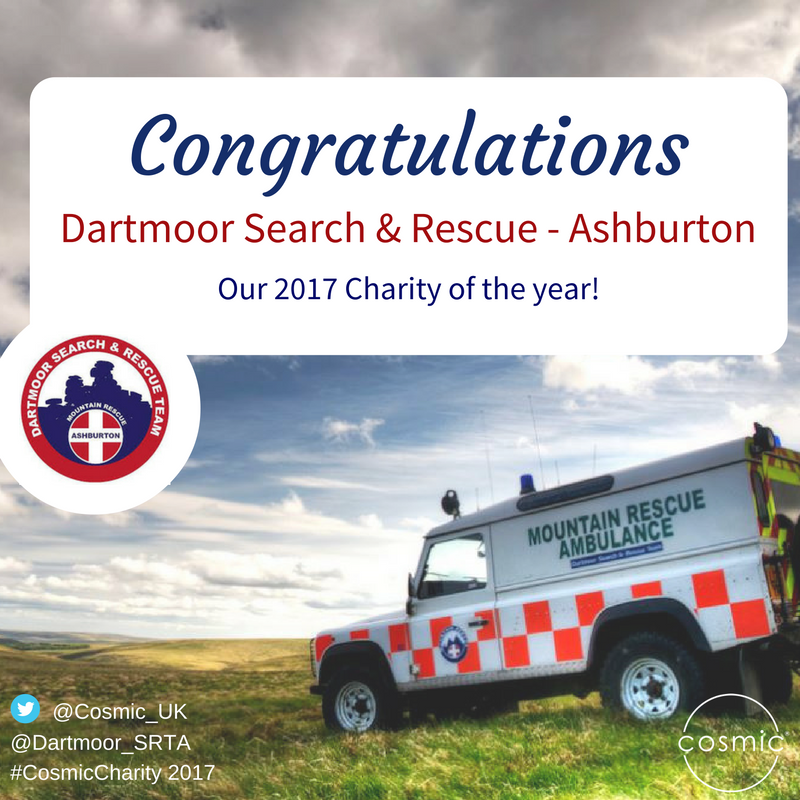 Despite them all being such deserving charities, the Dartmoor search and rescue team Ashburton is the charity that won the public vote. So far this year, the number of callouts that Dartmoor search and rescue Ashburton have responded to has doubled from 2015! They also celebrated 40 years of saving people’s lives making it even more suitable as Cosmic’s 2017 charity. This charity is part of the Dartmoor Rescue group which was started in 1968 with the sole responsibility of searching and rescuing those who have gone missing on Dartmoor as well as the surrounding area of South and East Devon. Their services are often requested in situations where the Police, Ambulance service and Fire services require their help. They rely heavily on charitable donations and voluntary work from members with diverse backgrounds such as social care workers, electronic engineers and A&E consultants. Similar to our previous work with Headway Devon, we will offer a number of services that the charity is able to choose from. We will be delivering these services throughout 2017 free of charge and are delighted to be helping such a worthwhile charity. We are delighted to gain this amazing support from the fabulous team at Cosmic for 2017. We do recognise the benefits of what Social Media and a strong online presence can provide to a small charity such as ourselves. Helping to increase awareness of our life saving service that in turn helps to drive donations which is our life blood to our continued operation. However, we are volunteers finding the lost, missing, injured and vulnerable across Devon and not online marketers which Is an area we find quiet bewildering at times. Cosmic are highly respected for their expertise in the digital world and we are very much looking forward to having this invaluable support in boosting public awareness of the vital work our charity provides for the residents and visitors of Devon. We look forward to working with Alan and the rest of the team in the new year and are delighted to be supporting such a deserving charity.